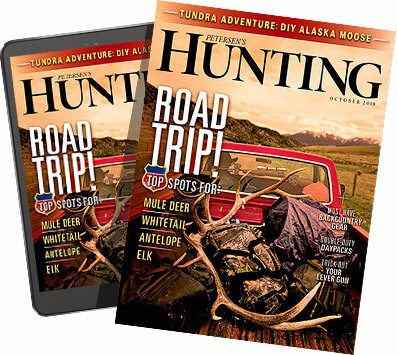 Last fall, I hung four elk quarters in a walk-in cooler, shut the door, and walked away. For years I’ve been aging my game meat, letting deer, elk, and antelope hang for a week or so, and giving game birds up to two weeks before processing them for the freezer. But this was the first time I’d had a true, controlled environment to age big-game quarters on the bone, and I was looking forward to an extended test.The cooler was set to maintain a temperature of 34 degrees with little to no fluctuation. I checked in on my meat a few times, feeling the outer rind and giving each quarter the sniff test to ensure this most-valuable trophy of my hunt wasn’t rotting away on the bone. Finally, 21 days later, I had a free day to cut the quarters into steaks and roasts. Aging game meat, including deer and other venison, does two things. It breaks down connective tissues via naturally occurring enzymes, resulting in a product that is more tender. It dehydrates the moisture within the muscles, leading to an overall weight loss of up to 30 percent, concentrating that meaty flavor we all love. The dry cap, which should be removed before cooking, and surface fungus account for a funky, cheese-like odor that is one of the hallmarks of well-aged meat. Whether you like the resulting flavor is personal preference; a little can go a long way. Start your aging experiment with a seven-day hang, adding days from there. I know people who age their deer for 28 days or more, though I believe the 18–21 day period offers the best balance of flavors. The primary key to dry-aging venison is temperature control. Bacteria thrive between 40 degrees and 140 degrees, leading to rotting meat and food poisoning. To inhibit bacteria growth and encourage enzymes to work, it’s imperative to keep the meat between 34 degrees and 37 degrees. The other important consideration when aging meat is adequate air flow. Here are three ways to age meat at home along with some of their pros and cons. Hanging a whole, skinned carcass or quarters of an animal in a cool, shady place is probably the most common way to age venison. Obviously, it’s also the cheapest and easiest, although it’s difficult to maintain a constant temperature in that ideal range. Hot weather is a concern during early seasons, and late in the year, freezing is a possibility. Open-air aging also invites insects and scavengers, so take care to keep your meat clean via game bags, cheese cloth, or other deterrents. If you have a spare refrigerator (or an understanding spouse), dry-aging venison quarters is a doable option. A refrigerator provides consistent temperature control, and by adding a small fan, it delivers proper air circulation. Hang the meat from the top of the fridge or employ a set of racks to keep the quarters from touching. You want the entire surface of each cut exposed to the air to prevent bacteria growth and moisture buildup. Check the meat every few days and rotate to ensure adequate airflow. This dream dry-aging setup is out of reach for most of us. 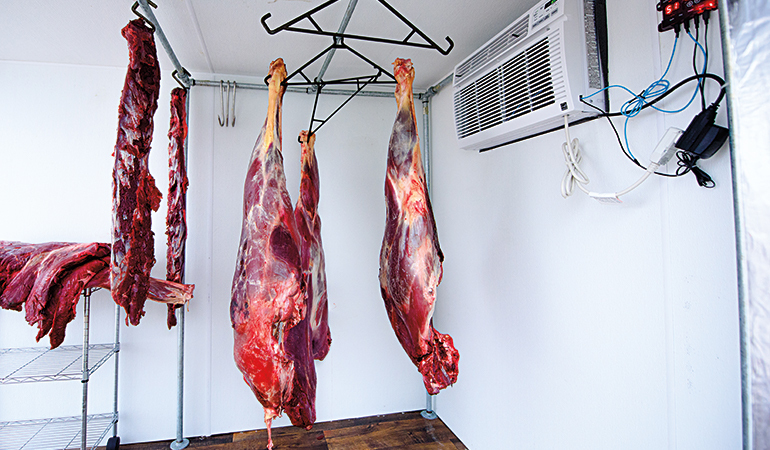 A walk-in cooler, whether commercial or homemade, delivers consistent temperature control and air circulation, providing the best way to dry-age meat for very extended periods. Expensive and bulky, the best walk-in cooler is the one your hunting buddy owns—as long as he lets you borrow it. In some areas of the country, meat locker rental is an alternative. The rind, or dry outer covering, I trimmed away from my 21-day aged elk quarters was thinner than I expected. What I found underneath was meat that was incredibly moist and soft to the touch. The color and tenderness was like that of a calf elk, rather than the big six-point bull I tagged nearly a month before. The true test came on the table, and thick-cut steaks from the sirloin roast were easy on the teeth and pleasurable to the tongue. My experiment was a success, and I’m looking forward to another lab session this season, pushing the hang time to 28 days and beyond.